Marlene van der Westhuizen is the author of seven books, Plate being a collection of simple and delicious brasserie-luxe style recipes, which she has cooked over the years. Feast on delicious, winter-approved meals that are easy to prepare at home for your family, or a special dinner with friends. 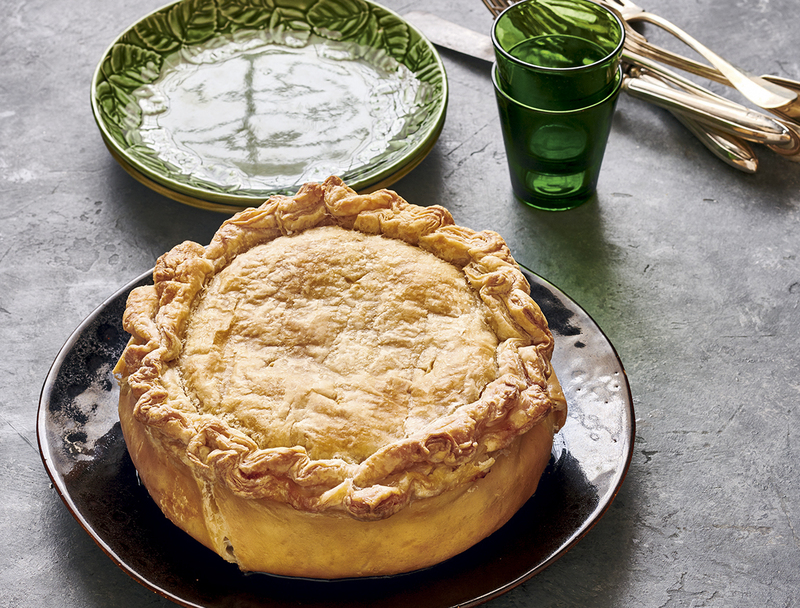 South African author Marlene van der Westhuizen's latest recipe book Plate consists of her favourite brasserie-luxe style mains, including a knockout chicken pie and hearty English soup that's sure to have everyone asking for more. 1. Pour the water into a large casserole dish, add the chicken with the bouquet garni and bring to a slow simmer. Cover and cook for 90 minutes or until the meat is completely tender. Remove the chicken from the pot and pour the stock through a sieve, reserving for later use. Allow the chicken to cool down slightly, then debone. 2. Meanwhile, melt the butter in another good-sized casserole dish. Add the onion and carrots and sauté until the onion has softened. Add the celery, apple, jalapeño, garlic, ginger, tomatoes, curry powder, cumin, paprika, cinnamon, turmeric, and cardamom. Gently stir all the ingredients together. 3. Infuse the flavours over a medium heat and add the lentils. Pour the reserved chicken stock over and bring to a boil. Turn the heat down and simmer, covered, for at least 45 minutes or until the lentils are cooked. Add a little more water if you think it is necessary. 4. Using an immersion blender, pureé about half of the ingredients; it is lovely to leave some of the bits and pieces whole as it adds body to the soup. Pour in the coconut milk and bring to a simmer. Taste the soup and season. 5. While that is simmering, heat the olive oil in a pan and toss the shredded chicken lightly through to heat. Taste and season with salt and a light dusting of chilli powder. 6. Add dollops of the steaming rice to shallow soup plates, top with the seasoned chicken and spoon large soup ladles of the mulligatawny broth around the rice and chicken. 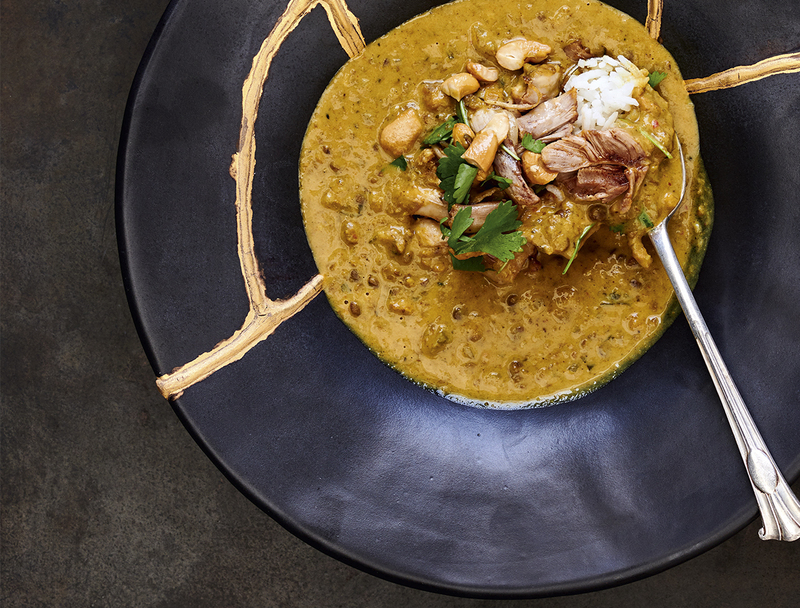 Garnish with a generous amount of cashews and coriander. 7. Serve with both a spoon and fork! 1. Grease a springform cake tin with butter and then line it with one sheet of puff pastry. Prick a few holes in the pastry with a fork and brush with the egg white. Refrigerate the lined tin until needed. 2. Pour the wine into a large casserole dish and add the whole chicken and the chicken wings. Add the bouquet garni, garlic and celery and bring to a boil. Cook for at least three minutes before adding enough water to cover the chicken. Cover, turn down the heat and leave to simmer gently until completely tender. 3. Remove all the chicken from the casserole dish, allow the meat to cool a little, then debone. Reduce the stock to enhance the flavours, then pour it through a sieve into a bowl and set aside. Meanwhile, pour the olive oil into a heated pan, add the leeks and fry until tender and translucent. 4. In a medium casserole dish, melt the butter and stir in the flour with one hand while adding the reserved chicken stock with the other. Keep adding the stock until it becomes a really thick and smooth sauce. Remove from the heat and stir in the cream. 5. Whisk the egg and fold it deftly into the slightly cooled sauce. 6. Preheat the oven to 180ºC. 7. Spoon the creamy sauce over the leeks, add the shredded chicken and mix until well combined. Taste and season with salt and white pepper. Spoon the filling into the prepared pastry shell. Cover with the second sheet of pastry. Fold the two sheets neatly together around the edges and trim where necessary. Bake for one hour. 8. Serve with a crisp green salad. 1. To prepare the marinade, pour the wine into a large pot, then add the olive oil, onion, carrots, bouquet garni, garlic, whole cloves, peppercorns and juniper berries. Bring to a slow boil and simmer until the alcohol in the wine has evaporated (about 10 minutes). Switch off the heat and allow the marinade to cool completely. Strain, discarding the bits and pieces. 2. Place the beef in a bowl (with an airtight lid) and pour the marinade over to cover it completely. Cover the bowl and refrigerate for at least 1 day. 3. Remove the meat from the marinade and pat it dry. Reserve the marinade for later use. 4. Heat the oil in a large pot. Braise the beef until the fat starts to run a little and the meat is slightly browned. Add the bacon and braise with the beef. Add the garlic and the stock, along with the reserved marinade and bring all to a gentle, rolling boil. Cover and leave to simmer for 2 to 3 hours, then test the meat with a skewer – it should be completely tender. 5. Remove the beef from the pot and let it cool a little before deboning. Slice the beef into nuggets and set aside. 6. Add the onions and carrots to the liquid in the pot and cook gently until it has reduced to a rich, thick sauce. Add the beef to the sauce, season to taste and reheat it. Spoon the meat and sauce into a serving dish. 7. While the sauce is reducing, melt the butter in a small pan and allow it to become quite brown before you add the mushrooms. Caramelise the mushrooms and spoon over the beef bourguignon once you’ve placed it in a serving dish. 8. 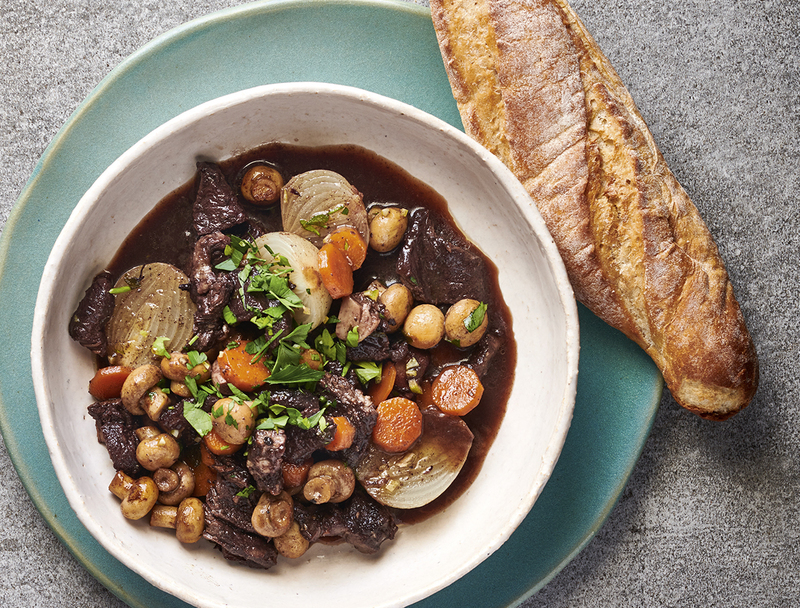 Garnish with the parsley and lemon zest and serve with crusty bread and a glass of pinot noir.